Another warm, sunny day. Another cool treat with chocolate in it. 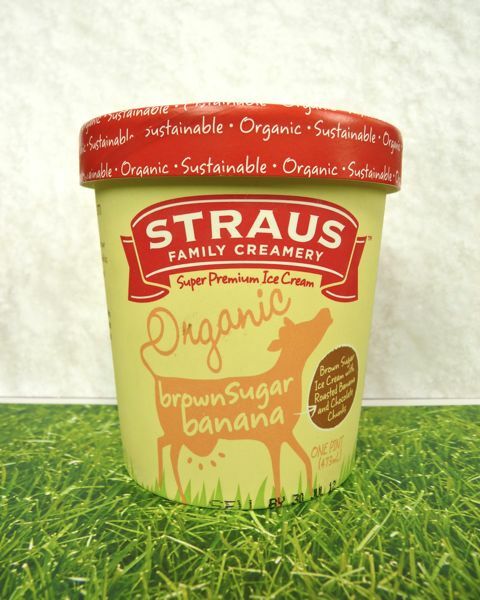 What could be better than organic, gluten free, authentic tasting, rich, creamy, Brown Sugar Banana ice cream from Straus Family Creamery? Why some chocolate of course. In this case, chocolate chips. The chocolate chips added some crunch, but as with all chocolate chips in frozen ice cream, the chocolate flavor itself was not as accessible in semi-frozen state. 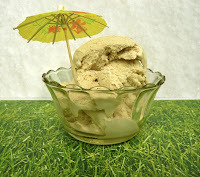 Possible toppings to help accentuate a chocolate flavor: a teaspoon of Kahlua (rum and coffee liqueur), or rum chocolate sauce as a light, accent flavor. Too much chocolate sauce would overpower the subtle banana and caramelized brown sugar flavors. A slice or two of fresh banana would be delicious too. 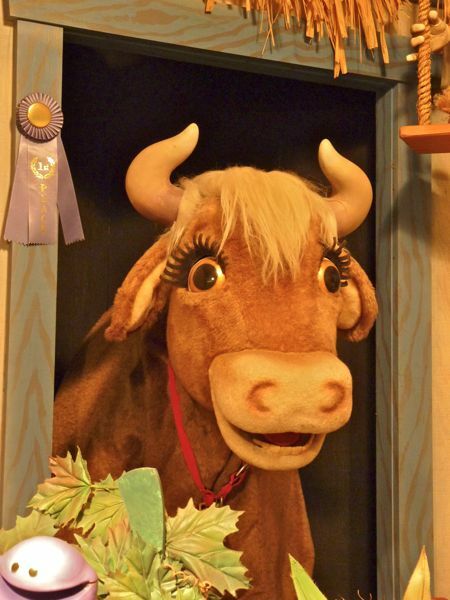 Today was Day #4 of Chocolate Cow Theme Week. 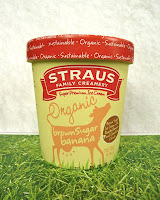 I bought this ice cream at Molly Stone's, a local supermarket. My favorite part -- a visit to the produce section, where there was an animatronic farmer and barnyard full of animals -- including a friendly cow. This group came to life and performed periodically. 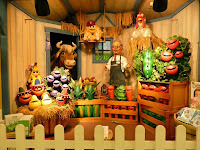 I'm sure these characters were singing about fruits and vegetables. And, no, it wasn't a chocolate cow; but I'd love to see a singing piece of chocolate (cacao fruit?) in that line up too.